Dervaes family trademarks "urban homestead"
I can understand the urge to protect their intellectual property (even though I feel like, in today's digital age, that kind of "mine!" mentality is a bit misguided.) 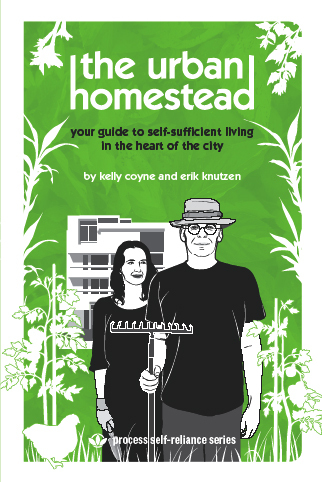 Just the other day, I noticed another book with "urban homesteading" in the title, and I understand that publishers are getting ready to churn out yet more books on the topic. "If your use of one of these phrases is not to specifically identify products or services from the Dervaes Institute, then it would be proper to use generic terms to replace the registered trademark you are using. For example, when discussing general homesteading or other people’s projects, they should be referred to using terms such as ‘modern homesteading,’ ‘urban sustainability projects,’ or similar descriptions. "When using a phrase listed above to refer to the work of the Dervaes Institute, proper trademark usage should include the proper trademark notice [®], use the protected phrase in all capital letters, and note in close proximity that the term is a protected trademark of Dervaes Institute." The Dervaes family say on their blog that we shouldn't be pissed off about this because all kinds of other terms (like biodynamic and simple living) are trademarked, adding that we should be glad they trademarked the term rather than leaving it to be trademarked by an evil corporation. However, my gut feeling is that those of us who make our livings from the homesteading movement have a moral obligation to help that movement rather than hindering it. The Dervaes' actions feel a bit like it might feel if Barbara Kingsolver tried to make people stop using the term "local food". I'd be curious to hear your take on the matter. Meanwhile, if you've linked to any of their sites in the past (urbanhomestead.org, dervaesgardens.com, peddlerswagon.com, freedomgardens.org, barnyardsandbackyards.org, and homegrownrevolutionfilm.com), I recommend you take down the links to help the Dervaes family understand that giving a little bit to the little guys impacts their bottom line. I wonder if most folks know the difference between the Principal Register and the Supplemental Register at the United States Patent and Trademark Office? According to unconfirmed sources, the Dervaes trademark of urban homesteading is on what's called the Supplemental Register as opposed to the Principal Register. According to Wikipedia being in the Supplemental Register does not confer any additional rights on the holder of a mark beyond those provided by common law. In United States trademark law, the Supplemental Register is the secondary register of trademarks maintained by the United States Patent and Trademark Office. It was established in 1946 by Subchapter II of the Lanham Act, to allow the domestic registration of trademarks that do not meet all the requirements for registration on the Principal Register, so that the holder(s) of such a mark could register it in another country. This was necessary because under the Paris Convention for the Protection of Industrial Property foreign registration was not permitted in the absence of domestic registration, and the trademark laws of countries outside the U.S. often have less stringent registration requirements for marks. The only requirement for registration on the Supplemental Register is that a mark be capable of distinguishing goods or services, not that it actually serve such a function. Registration on the Supplemental Register does not confer any additional rights on the holder of a mark beyond those provided by common law. Marks registered on the Supplemental Register are not subject to opposition proceedings, but they may be canceled at any time by a court. Holders of such marks are still permitted to sue for trademark infringement. I guess this is the real trouble with urban homesteading. While the idea is wonderful --- make a difference where you're at --- in reality, you have a lot more bills when you live in the city than if you settle in a trailer in the woods. I just feel lucky we opted to settle in a rural area. ..or greedy, or something else. I have never heard of this family and I don't think I want to either. What self-respecting institution would have trademarked/copyrighted these simple terms in the first place? It's ridiculous. These terms were around way before this group started eating pablum, oops, I guess that's Pablum. Sounds like an evil corporation did get the terms after all. Hmmm, to me, trademarking a term which has become the name of a movement, after the fact, seems both petty and grasping, not to mention counterproductive (especially if they want the movement to succeed). It rings of a "me, me, me" attitude which I normally do not associate with homesteaders. I do understand the desire to control one's intellectual property, and, if they are indeed the originators of the term, I would have no problem with them having trademarked the term when they first thought of it. However, doing it at this stage of the game seems rather mean. Visit a depressed urban or rural area, and you'll see many abandoned pieces of land going unstewarded, while the few who are sticking it out in the area work around them. The landscape is made static by property laws and economics. These people are trying to do that to language. Happily, language is much better at finding ways to work around such things. For example, nobody talks about "UNIX (TM)" or "UN*X" anymore. Unhappily, considerable bother is needed for such an adjustment. The irony that they probably live in a landscape blighted by this same problem, and are probably constantly working against it there. I went to their website and they have a tweet saying they are not suing bloggers for using these terms and that it is a false and unfounded claim, but if they are sending cease and desist letters that's still waaaay wrong. I guess they are trying to do damage control. Keep us in the loop if you hear more about this please! These terms are so generic that I wonder why they are even eligable for trademark protection? But then a lot of lobbying has distorted the several types of distinct laws (copyright, patents, trademark) that are commonly if erroneously lumped together as "IP". I can understand giving an author an incentive to create more works by allowing him a goverment mandated monopoly on copying his works, so he can profit from it. (copyright) But since an author cannot create works when he is dead, any copyright term extending past the lifetime of the author is just gratuitous lining of the pockets of middlemen who had no part in creating the work. Also, the explicit target of copyright is to eventually enrich the public domain; they are meant to expire. The current copyright term of 90 years after the death of the author means that noone alive today will see works created today become part of the public domain; copyright has become effectively eternal. That patents were created in a similar matter to give an incentive to invent I can understand as well. But the fact that you can patent things like software (which is essentially math), business methods and even existing genes (which might be discoveries but certainly not inventions) means the system has gone too far. Patents can also easily be abused to prevent competition instead of to "promote the progress of Science and useful Arts". The picture of the book cover in your post is not from the Dervaes family but from a nice couple at http://www.rootsimple.com/ I have been following their blog and I'm sure they would not want to be confused with these trademark fiends! Hopefully, people will see the difference, but I just wanted to put that plug in. In any case, I am ADDICTED to your blog! Thanks for all the great posts. I started my orchard this spring and am constantly referring to old posts for tips and tricks on this and other new endeavors on my city farm! Any idea what the real story is? If someone is setting them up, how crazy! Ikwig --- You said it even better than I did. It's the counterproductivity that gets me --- if you want the movement to succeed, you won't try to keep other people from using the term. Joey --- I've heard you talk about this issue before, and never completely saw your point, but this makes a lot of sense. Roland --- It all comes down to money for the big guy. Which is just sad since so many innovations come from little people tinkering in their garages --- that's clearly who the laws were originally meant to protect before lobbyists got involved. Erin --- Thanks for making that distinction --- I was including that photo of the bookcover to refer to the books coming out right now with urban homesteading in the title. If the data I found online is right, the couple is one of the groups that received the Dervaes' letter. I'm glad you chimed in about the benefits of urban homesteading. The more I thought about it, the more I agreed that it really is possible to live simply in the city, especially right now when Americans create so much waste. That's one of the huge benefits you have over someone like me --- we try to snag as much organic waste as possible from the surrounding area, but it requires some driving even so, and you can presumably just take a yellow wagon and walk down the street to pick up lawn waste, food scraps, and much more. The page on the Dervaes site that you linked to is technically correct --- they aren't suing anyone. However, from the best information I can find online, it sounds like they sent out 16 cease and desist letters (which have softish language and don't come out and say "cease and desist", but which would definitely make someone like me who can't afford to be sued consider just doing what they tell me to do.) In a way, that feels almost worse. I don't think they have a legal leg to stand on if they wanted to sue someone over the issue, but by choosing to send their letters to people who can't afford to pay for lawyers (like a public library), they are basically doing the same thing. Best way to deal with such idiocies is to ignore them and dare them to sue you. I think the best thing we can all do is to contact any family, friends or acquaintances we have who live in or near Pasadena, CA and ask them to contact every single restaurant that buys food from this family. Hit them where it counts - their pocket book - since that's obviously what they are trying to grow (not veggies, these days). I once had a geographically-city-oriented, self-sufficient vegetable-&-food-producing-animal family-housing-unit. Now we live in the country. But I think people who have geographically-city-oriented, self-sufficient vegetable-&-food-producing-animal family-housing-units are great. I hope there are more of them. By the way, I'm tradmarking "geographically-city-oriented, self-sufficient vegetable-&-food-producing-animal family-housing-unit". From now on you have to just say "My thingy". Lisa --- good call with the link to the letter! I had read that, but forgot to not-link to it. Daddy --- That's probably what we would do if they bullied us (which they haven't), but it seems like a shame for the general homesteading community to continue to support them when they've been so un-neighborly. That's why I figured we should start a stink about it. Everett --- Great idea about contacting folks near Pasadena to ask them to contact the restaurants. Good thing I don't live in the city, since I now can't talk about Geographically-city-oriented, Self-sufficient Vegetable-&-food-producing-animal Family-housing-units (TM) (a registered trademark of livingasimplelife.com. I was just notified of this by one of my facebook groups. My first inclination is to be pissed, because... well, that's just how I feel. Beyond that initial reaction, I'm not sure what to think. I know it has been a popular phrase and I'm sure I've used it before. I had no idea it might have originated with them or that anyone would be territorial over it. However, I think I'm definitely going to follow your advice and take down my links. It just doesn't seem right to me, for all the reasons you've cited. "I had no idea it might have originated with them"
That's the funny part --- they don't even claim to have originated the term...because they didn't. http://naturallifemagazine.com/blog/?p=408, for example, claims that they've used the term "urban homestead" in their print magazine since 1976, while the Devraes family have only been urban homesteading since 1985. I'm glad you removed your links! I agree with the poster above who said they seldom go to their site anymore because it's so corporate-looking. They watermarks all over their pictures are annoying. If I wanted a picture of a jar of canned tomatoes or a pretty basket full of veggies I could take one myself -- eesh. I just wonder what they are going through, as individuals, that spurred them to do this? Wanting security and to benefit from the fruits of one's labours is forgivably human. Maybe they have had it with spending their whole day growing food, have started to enjoy thinking of building a business, etc. Maybe that is the evolution of things -- we get complicated, we go back to simple, we enjoy simple for a bit and then want to build and grow again. The homestead movement is all new and exciting for city people but maybe long-time farmers and people like this family are tired of spending all day tending food and they want some of the fun stuff that city people thrive on -- blogging, building their businesses, thinking of how to build multiple income streams. But, in the end, though I can sympathize with why they may have shifted gears, it's unappealing to me and I don't visit their site very much anymore. You're probably right on track with their motivations, and you're right that we should be considering what they're currently going through to make them want to do this. I see people fade out of the simplicity movement for just those reasons all the time, and I hope that you're right that people cycle back in too! I agree that it is plain silly! I used to link to their blog several years ago when it really was just gardening advice, but things got too complicated for me when they started selling t-shirts. I think I'm going to trademark "yardening" for our style of town-centered back and side yard food cultivation. I'll do that one, too, like Everett, to cover the bases. Quite silly. Maybe they'll take it back. Seems like homesteaders are stick-it-to-the-man kind of people who are beyond these silly things, anyway. Brandy --- "Yardening" sounds very catchy! Better snap it up. It's almost always greed and money when people want to lock down something like this. No matter that they say they are non-profit, you don't get into it the way they are unless there is some money there somewhere. The first time I noticed this kind of thing was with some of the "free thought" flower power folks during the 70's and 80's. It's amazing how nasty some folks can be, all the while talking flowers and peace out of the other side of their mouths. It's easy to lose your footing on that slippery slope. And I do believe that it's better to be making your living while doing something you're passionate about and that helps the world, rather than spending 40 hours a week in drudgery and then giving everything you do away for free. We are a local indoor farmers market in Denver named "Denver Urban Homesteading". My husband and I work for free about 2 years and subsidize this market from our other business. We want our farmers/vendors to keep prices affordable. We had a Facebook page with the same name that is different from Dervaes trademarked name. Our activity has nothing to do with Dervaes business. We are in Colorado. Without any notice our Facebook page was disabled on February 14. It wasn't easy to undestand why and by whom since we didn't violate any Copyright. Dervaes who works for themselves successfully registered as a church and probably pays no taxes falsely disabled facebook page with 2,200 our customers contacts. As a result our local farmers and small vendors bear loses. We can't ignor them now because they damage our community. And they want to continue this damage. Recently I received their letter. Thanks a lot - we already know who did it to our facebook. They disabled their email and any attempt to email request to their institute is unsuccessful. We work hard and find solution, but I don't undestand why I have to waste my days and weeks to proof that I have rights to call our movement Urban Homesteading - something I am doing during all my life since early childhood and without Dervaes. I'm so sorry to hear about your struggles! It sounds like you should complain to facebook --- I think they were covering their butts, shutting you down, and you might be able to get them to see the light. Sadly, it seems to have blown over with no resolution that I can see. It looks like they've opened their blog back up, though, so I guess you can go comment there now if you want to let them know how you feel. MOTIONS FOR SUMMARY JUDGMENT TO CANCEL DERVAES INSTITUTE TRADEMARK FILED. (MSJ) What is an MSJ? A motion is a request for some court action. There are routine motions to approve a trial schedule or a settlement agreement. Motions are the way that lawyers involved in a court case communicate with the court (the judge) and ask it for one or another of hundreds of decisions that the court can make for or against one party or the other during a legal proceeding. Normally, a court dispute culminates in a trial. But a motion for summary judgment shortcuts this process by allowing a judge to decide the case based on undisputed facts that support one side or the other. This saves months or years of time and money getting ready for trial and having a trial. If the judge rules in our favor on the MSJ, the case is over and we win. However, if the MSJ is denied, the case proceeds to trial. While losing a motion for summary judgment does not mean that we will lose at trial, winning is a great victory that doesn’t happen often and which saves all of us time and money. And unfortunately, the USPTO is reluctant to grant motions for summary judgment in order to give every opportunity to defend the case. So start now and hold your breath. You can read our motion at http://www.denverurbanhomesteading.org/ or at the USPTO website where the Winston & Strawn motion is or will soon be published. Irina --- Thanks for the update! It's sad to see that, a year and a half later, the Dervaes family still owns the trademark, but hopefully you'll win your most recent request. I recently heard about this ridiculous matter of trademarking common English terms; and not wanting to judge hastily, I called the Dervaes family to inquire about it. They were defensive and snippy; and I was told they cannot speak on the matter because of current lawsuits - I just want to point out that the term spoken to me was plural, meaning they're currently engaged in more than one lawsuit. And rightly so.